When did everything become “epic”? Epic this, epic that. It’s become the go-to adjective for just about anything lately. Recently I even saw a sign in my neighborhood, directing people to an “EPIC GARAGE SALE”. (I never saw the sale, so I’ll just take their word for it). 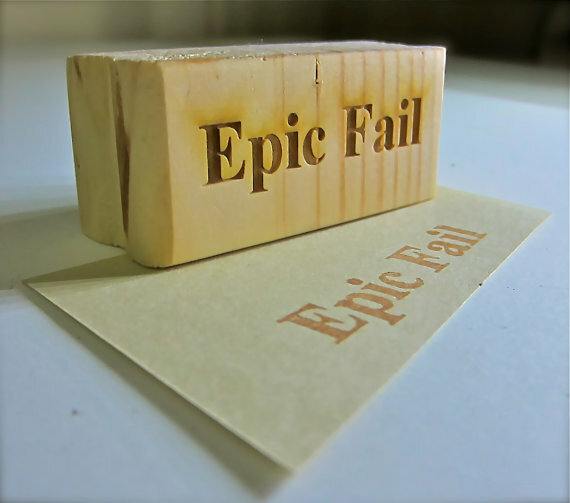 Take the expression, “epic fail” – I’m not exactly sure where the line is drawn between a regular ol’ fail, and an “epic fail”, but you can’t deny that it’s a pretty popular catchphrase. It’s safe to say that most organizations want their newest team members to have an epic new employee experience. But what happens when that experience doesn’t measure up? How is the organization impacted? How is the ultimate success of the new employee compromised? 1. There is no clear tie to the company’s mission, vision or core values. Your new employees need to know what the company stands for. What the purpose is. If you’re not giving those new employees more to strive for than getting a paycheck every 2 week, then you’re not likely to turn them into raving brand ambassadors. And shouldn’t your employees be some of your strongest advocates? 2. There is no mention of your customer, whoever that may be. Everyone – let me repeat, EVERYONE – should understand their direct path to your customer. Sometimes, it’s tough to illuminate that path. For example, how does the guy in the mailroom know how he impacts the customer experience? That’s your job. Make him aware of how his job matters. How the customer experience can be influenced by him doing his very best. When you have the customer at the core of everything, you can’t lose. 3. New employees walk away with more questions than answers. Obviously, some questions will arise over time. There simply isn’t enough CONTEXT to absorb everything on Day One. But if your Orientation participants walk away confused, or you end up with a dozen seemingly “basic” emails from them in the days following your session, maybe you need to look at your content and ensure that it is appropriate. Make sure any provided materials or online resources are clear and accessible. Consider your “lowest common denominator” – the person who walks in on his first day, without understanding of your business or processes – and make sure that person can grasp what you’re presenting. It’s not much of a “resource” if no one can find it or understand it! 4. The sole focus of your session is policies, procedures and paperwork. I get it. A certain element of “compliance” needs to occur during Orientation. It’s important to make sure that I-9 forms are completed, direct deposit forms are turned in, and that Oscar-worthy sexual harassment video has been watched…yada-yada-yada. But let’s be honest – covering “policy-related” topics is merely a fraction of how you should be spending your day/s with new employees. There is so much more to Orientation than that. Let’s face it, Orientation is your ONE opportunity to engage new employees before they are riddled with work, bombarded with meetings and biased by office politics. Make the most of that precious time. 5. Your program is boring. Snooze. Don’t read them a PowerPoint and expect them to have learned something. Make it interactive. Make it engaging. Make it relevant. Think of every awful, boring Orientation or training session you’ve ever attended, and then vow to never, ever do that to someone else. If you need ideas or resources on how to make your sessions more creative or engaging, there are countless online resources. Langevin has a great blog. There are a number of discussion groups for training professionals on LinkedIn. There are other blogs out there like mine or Train Like a Champion. Or, you know what? Just drop me a note sometime. I’ll brainstorm with you. I’ll give you advice. If you want some tough love, I’ll even smack you around a little bit give you some constructive feedback. If you need an entire program audit or overhaul, we could even talk about that. 6. Your executives have no idea what happens in Orientation. If the ultimate decision-makers don’t know what’s happening, or what value your program brings to the organization, how can you expect them to support it? Getting “executive buy-in” is not a new topic, but it bears repeating. Engage your leaders – get them involved in the program, or at the very least, keep them updated on what your program offers and the benefit it provides. If you, personally, do not have the ear of an executive, your boss (or maybe your boss’ boss) does. Encourage your own departmental leadership to be your program sponsor. 7. You have no partnership with hiring managers during the Orientation/Onboarding process. Some people might think I have it in for hiring managers. After all, I tend to call them out a lot about their role in the onboarding process. But it just so happens that building relationships is key when starting a new job. And I can’t think of a relationship that is more critical to the success of a new employee than the relationship s/he has with a direct supervisor. Conversations must be initiated. Alliances need to form….certainly between the new employee and the supervisor, but also between the “owner” of the Orientation process and that supervisor. Those hiring managers need to know what is included (and NOT included) in Orientation, how long you will be spending with the new employee and certainly some guidance on how to promote learning transfer from Orientation to the new employee’s role. Because after all, Orientation is an event. Onboarding is a process. I hope you read those seven signs and laughed. And told yourself that your Orientation program is incredible – epic, even – and you can’t possibly make the new employee experience any better than it is right now. But, if you read those seven signs, nodded, maybe gave a little sigh…just know there is so much potential. New Employee Orientation, thankfully, isn’t a program that needs a huge budget to be successful. It’s all about the welcome. The impression of your organization that you are bestowing upon your newest team members. It’s a huge responsibility, but it isn’t complicated. Yesterday, I had the opportunity to attend a TEDx event, here in good old Indianapolis. (It definitely fit the “epic” bill, but that’s another story.) One of the presenters was Kristin Wright, whose story really spoke to me. Her talk was titled, “The Power of Welcome” – look for it next month when the video is available on the TED website. Kristin is involved with local immigrant families and refugees; her talk encouraged us to embrace these families as they arrive in our cities and neighborhoods. Her comments about “building a community of welcome” apply to the new employee experience, just as much as welcoming immigrants and refugees to our communities. You are part of someone’s crucial first moments, friends. Make it epic. I was going to hone in on one of the seven items and make some brilliant addition or comment, but every single one of your seven points is right on. I particularly like #5 (specifically the resources/sites you reference). I’d have to say that #2 is perhaps one of the most overlooked aspects of new hire orientation – often there seems to be an (erroneous) assumption on the part of the business that everyone understands how their role impacts the customer. Great – no, make that epic – post, Michelle! #2 is something we’ve really made a conscious effort to improve this year (at the day job). We found that by illuminating that direct (or sometimes indirect, but still present) path to the customer from Day One, we know they are getting that message loud and clear…because who knows if they’re getting that message elsewhere? As always, appreciate your comments! Excellent post. I agree with all your points. #4 (“Orientation is your ONE opportunity to engage new employees before they are riddled with work, bombarded with meetings and biased by office politics.” …This one especially resonates and can not be stressed enough!